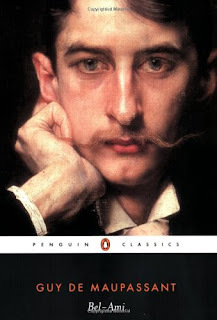 "Bel Ami is French author Guy de Maupassant's second novel, published in 1885; an English translation titled Bel Ami, or, The History of a Scoundrel: A Novel first appeared in 1903. The story chronicles journalist Georges Duroy's corrupt rise to power from a poor ex-NCO to one of the most successful men in Paris, most of which he achieves by manipulating a series of powerful, intelligent, and wealthy mistresses." The decision by the QMBC to read an undoubted literary classic is almost certainly an act of defiant literary and intellectual vanity in the face of the quickening cultural race-to-the-bottom; that is everywhere, and taints everything nowadays. Its selection pays an indirect homage to the late 19th and early 20th century - the most gentlemanly of eras. Certain tabloid commentators might point to the timing of the QMBC's decision to finally take on this novel after a number of unsuccessful previous nominations as highly suspicious. In that regard, the QMBC would like to formally declare that they were absolutely, positively, in no way, influenced by the recent big-budget Hollywood release of Bel-Ami starring the dreamy Robert Pattinson. When questioned about this "apparent coincidence" on his recent return to Ireland from his Victorian world-tour: Mycroft Webb (QMBC Chief Pudding Officer) was almost incandescent with rage about what had occurred in his absence and was heard to shout a single word before storming off to the sanctuary of his club -"Debacle! ".